We're Awakening! : New Switchfoot singles galore; "Your Love Is a Song" to follow "The Sound" as the third single; Switchfoot covering the Beastie Boys? New Switchfoot singles galore; "Your Love Is a Song" to follow "The Sound" as the third single; Switchfoot covering the Beastie Boys? - There will be a music video filmed for the single. - It WILL be a "legit" music video - in fact, there have already been some early treatments drawn up for this video, though there is nothing concrete yet. - But this video will NOT be filmed by Jennifer Love Hewitt. No? No. - Jennifer Love Hewitt will direct the video for the *THIRD* Switchfoot single which will be... *drum roll* "Your Love Is A Song". - That music video? That one will be, and I quote, a "legit, legit" music video. - The guys have already met several times with JLH (turns out she's been a Switchfoot fan for a long time) and are working on treatments for the video. Yeah, we've been sitting on this news all week, so apologies to those who got mildly annoyed at my vagueness. :P Anyways, thoughts? How awesome does this sound? This summer is going to be awesome. We're planning some great promotion ideas and would love to get feedback from all of you, so please reply with a comment letting us know! I am in seat 23 E on a flight from San Diego to Dallas. It's a middle seat. I'm trying to remain composed and tranquil; I am failing. As far as I can tell the baby behind me feels about the same way I do. I thumb through the airline magazine (my regular watering hole for current events), until I start to wonder what viscous substance stuck the pages of the magazine together in the first place. I put the magazine back, stretch into the seat, and rub a sore neck. "Maybe truth is not something that I can possess. Maybe truth is something which possesses me." I look at the words now scrawled on the back of my hand. I think it over and look away. The clouds are turning colors, blue, grey, green, purple. The sun is setting off somewhere behind me. It's my favorite time of day. I look back at my hand and read the idea again. "Maybe truth is something which possesses me." We now have more information than thousands of years of humanity could ever dream of. Without any effort at all, we could know the weather anywhere around the world, the population of Taiwan, or the first lady's middle name (I'm going to look it up as soon as I get off the flight). With this sort of data at our fingertips, we truly possess more facts than past civilizations would ever hope for. And yet, the meaning of it all is just as elusive as ever. I'm still sitting on a plane unsure as to whether the middle seat is occupying me or the other way round. The idea spins around in my head -- so I look to folks that are smarter than me. I turn my thoughts to Sir Isaac Newton and the physical law most commonly associated with his name: gravity. The basic idea of gravitational pull is simple to understand -- a clumsy step on the stairs could prove Newton right. And yet this awkward fall does not prove that I am now the proud owner of gravity. No, quite the opposite. I might have a bruise or worse to call my own, but gravity certainly possesses me. I am under the dominion of the truth of gravity whether I fully understand the law or not. I look out at the fading hills and imagine someone driving home from work. He's going bald quicker than he thinks. He just bought himself a car that screams one thing: MiddleAgeCrisisSportsCar. He begins the drive he takes home from work everyday. The traffic lights, the cars around him, the flat tire...these are all facts that he encounters on the way home; this is the data that he is responding to. He is under the influence of the facts around him. It's not determinism; free will is still involved. And yet, rarely will he choose to ignore a red light or slam into the car next to him. He does not possess the facts, the facts possess him and he drives accordingly. Our market economy is fueled by ownership. The water we drink, the land that we live on, even our ideas are referred to as intellectual property as our world becomes homogenized into merchandise. These products are to be bought or sold -- anyone's private possession for the right price. But from time to time we ask the question: Who owns who? Is the MiddleAgeCrisisSportsCar the possession of a man who's losing his hair? Or is our balding friend possessed by his MiddleAgeCrisisSportsCar? Does he give the car her identity, or does the MiddleAgeCrisisSportsCar with her sleek lines and bright red paint lend the gentleman her personality for a brief moment of remembered youth? Yes, our possessions possess us far more than we'd like to admit. And yet, even in our capitalist culture, we don't think of our friends or family this way. Outside of the greek life at college, most relationships have nothing to do with money changing hands. Yes, you may possess friends, but you would never call these friends your possession. When we fall in love we fall under the spell of another. You might say that your buddy is whipped, "He is possessed. She owns him." The truth of the one you love is most certainly something that possesses you and not the other way round. The stewardess hands me my orange juice. She sees the writing on the back of my hand and throws me a Sarah Palin comment. Dang it. Chris Martin disclaimers were hard enough. I explain that I've been writing things on my hands for a long time. There, good. At least we have an understanding. Now she has the truth. I look back at my hand, even writing this particular truth down on the back of my hand is a reason to think: Do I now have possession of this truth, owning its understanding or am I now temporarily tattooed with this truth, subservient to its reality? The idea of defending an all-powerful deity feels a bit silly when it's put out in the wind like that. And yet, that sentiment seems to epitomize much of what religion has come to mean. After centuries of witch-hunts, inquisitions and holy wars, many are still fighting hard to defend their faith in an omnipotent God who has no need of our protection. Maybe we are still protecting our beliefs as though we were the owners of this truth. "Spend of your substance, out of love for Him, for your kin, for orphans, for the needy, for the wayfarer, for those who ask, for the ransom of slaves, to be steadfast in prayer and to practice regular charity." The "truth" of loving those around me, the "truth" of seeking justice for the oppressed, the "truth" of a life of service -- these are truths to be possessed by: to be a slave in the service of the kingdom of the heavens, to be the servant of all. If the truths in this life have no owner then we are set free: free from the need to defend the truth, free to be possessed by this truth and simply live it out. Truth becomes much too large for me to possess; truth is the beauty and authenticity which possesses me. Maybe the meaning of life is not something that I can control, but rather a reality which possesses me. Maybe there is no life guiding "fact" that I can put in my back pocket, as though I were the sole owner of the universe. Perhaps The-Meaning-of-Life-Himself is asking me the questions. When I look at a sunset, when I hear the songs of the ocean gulls, when I feel the warmth of family and friends, I am reminded of a story that is bigger than I am. Yes, this is my story but not mine alone. Truth was never mine alone. Truth is that which possesses me. ^Jon Foreman = modern day prophet? I think so. “I feel like we’ve had so many people that we look up to and respect come to the shows and say ‘I wish the CD’s represented the energy you guys have live.’ That’s always been the goal is how do we put that energy into a CD. The Astro Mess is a Silicon Fuzz design that has a taste of both vintage and modern fuzz. The birth child of Switchfoot’s Drew Shirley’s request and Josh Scott’s knowledge of fuzz, the Astro is a very unique and useful fuzz in the land of a thousand fuzz’s. 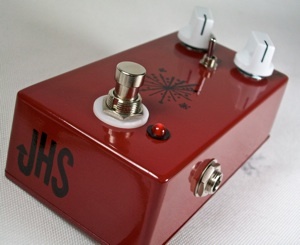 It comes equipped with a volume and fuzz knob as well as a gate toggle. Listen to Switchfoot’s “Mess of Me” or “The Sound” and hear how rich but yet violent this fuzz can be. ^Now that's what I'm talking about! Monday or Tuesday, look out for a new FootColumn analyzing all the singles news going around! Remember to comment with ideas on how to promote "The Sound!" WOW! That is really awesome! I think 'The Sound' + 'Your Love Is A Song' will do great and the music videos should be good! Pumped!! Same here! I hope Switchfoot can hit it in the big time for this record. Also, I hope Australia really digs these songs! hey that a really nice update on this... is really thanks for sharing the information.. .. Enter the 'Mess of Me' Roadie For A Day Contest!